ARP Hiei — Japanese Tier V battleship. A Battleship of the "Fleet of Fog". Modeled after the Imperial Japanese Navy's 2nd Kongo-class battleship, Hiei. Equipped with the "Mirroring System" bestowed by Musashi, she acts as the new flagship of the "First Oriental Fleet" after Kongō’s departure. Repurposing the Fleet as the "Student Council of the Fog", she maintains strict order within the Fleet of Fog as the "Student Council President". 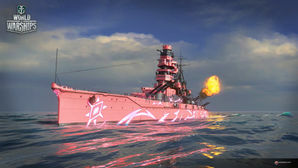 This warship has been specially designed for World of Warships, and is modeled after Hiei as she appears in "ARPEGGIO OF BLUE STEEL -ARS NOVA- DC". ARP Hiei comes fully upgraded, with the same upgrade slots found on Kongo and a captain with 6 free Commanders Skill points. As this is an ARP ship, ARP Hiei cannot mount camouflage. Hiei’s Mental Model, and captain in the game. Hiei in her expanded configuration, showing her "super-graviton cannon". Hiei as she appears in Ars Nova DC. Hiei as she appears in the game in Yokosuka port. Hiei (kanji: 比叡, katakana: ヒエイ) Kongō’s second in command and de facto leader of the Second Oriental Fleet after Kongō’s disappearance. In 2038, a mysterious fleet of warships, who have lurked around the world in the decades decades before, went on the offensive against humanity. Modeled after ships that appeared in World War II, but possessing weaponry far superior to those in humanity's possession and protected by an indestructible barrier immune to whatever we have to throw at them, humanity quickly loses control of the seas and our military forces are annihilated in the desperate battles against them. The result was a world where humanity's presence in the oceans is no more, with communication via the seas cut off and humans isolated from each other, blockaded by the "Fleet of Fog". Hiei is a fast battleship of the Fleet of Fog, with a Mental Model who appears as a high school student. She's the sister ship of Kongō, Haruna and Kirishima. After Kongō leaves the Fleet of Fog in the first movie, Hiei appears in an attack on the I-401. She identifies herself and announces her intention to take command of the Fleet of Fog. She introduces her subordinates in a system reflecting a student council, from which she is the self-proclaimed president. Hiei is highly intelligent, often adapting to the I-401’s actions faster than any other member of the Fleet of Fog. This makes her a dangerous opponent for the Blue Steel, and the movie ends with Hiei facing off against the I-401. In the manga, Hiei accompanies Kongō in the hunt for the I-401. In one confrontation, Hiei manages to analyze the I-401’s attack and properly defends her sister ship Kongō. Later, Hiei squares off against Hyuuga, the results of which have a major impact on the battle. In the Ars Nova Cadenza movie, Hiei tasks her team to defeat the I-401, having classified her as a "Traitor of the Fog". In much of the movie, she is seen planning attacks and deploying her student council to track and assault the I-401. Hiei is often vexed by her subordinates' inability to succeed, and becomes increasingly more interested in joining the battle. She is later defeated by Kongō who "bites" the ship's bow, leaving her unmovable but not destroyed. Hiei (比叡, "The Cold", named after Mount Hiei) was a warship of the Imperial Japanese Navy during World War I and World War II. Designed by British naval architect George Thurston, she was the second launched of four Kongo-class battlecruisers, among the most heavily armed ships in any navy when built. Laid down in 1911 at the Yokosuka Naval Arsenal, Hiei was formally commissioned in 1914. She patrolled off the Chinese coast on several occasions during World War I, and helped with rescue efforts following the 1923 Great Kantō earthquake. Starting in 1929, Hiei was converted to a gunnery training ship to avoid being scrapped under the terms of the Washington Naval Treaty. She served as Emperor Hirohito's transport in the mid-1930s. Starting in 1937, she underwent a full-scale reconstruction that completely rebuilt her superstructure, upgraded her powerplant, and equipped her with launch catapults for floatplanes. Now fast enough to accompany Japan's growing fleet of aircraft carriers, she was reclassified as a fast battleship. On the eve of the US entry into World War II, she sailed as part of Vice-Admiral Chuichi Nagumo's Combined Fleet, escorting the six carriers that attacked Pearl Harbor on 7 December 1941. As part of the Third Battleship Division, Hiei participated in many of the Imperial Japanese Navy's early actions in 1942, providing support for the invasion of the Dutch East Indies (now Indonesia) as well as the Indian Ocean raid of April 1942. During the Battle of Midway, she sailed in the Invasion Force under Admiral Nobutake Kondō, before being redeployed to the Solomon Islands during the Battle of Guadalcanal. She escorted Japanese carrier forces during the battles of the Eastern Solomons and Santa Cruz Islands, before sailing as part of a bombardment force under Admiral Kondō during the Naval Battle of Guadalcanal. On the evening of 13 November 1942, Hiei engaged American cruisers and destroyers alongside her sister ship Kirishima. After inflicting heavy damage on American cruisers and destroyers, Hiei was crippled by enemy vessels. Subjected to continuous air attack, she sank on the evening of 14 November 1942. Hiei’s fitting out in Yokosuka, September 1913. Hiei departing Yokosuka for Kure Naval Base, 23 March 1914. Hiei in August 1933, following her conversion to a training ship. Hiei undergoing full power trials off Tukugewan following her second reconstruction, December 1939. Hiei in Tokyo Bay, 11 July 1942. A damaged Hiei, trailing oil, is attacked by US Army B-17s, 13 November 1942. Hiei in her 1942 configuration. This page was last modified on 19 February 2019, at 09:34.